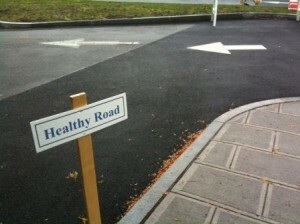 Healthy Road. Photo courtesy of Jennifer Holder. In the 1970’s I lived with my husband at the Cambridge Zen Center where we became friends with Jon Kabat-Zinn. Jon was active at the Zen Center although he lived in his in his own home with his wife and first-born child. Jon was the only one in the group who had become thus domesticated, and he’d often joke with us quoting Zorba the Greek who had responded to the Englishman’s discovery that Zorba had once been a family man with the statement: “Oh yes, the full catastrophe.” Little did we know that a few years later that would become the title of Jon’s landmark book on Mindfulness-Based Stress Reduction, Full Catastrophe Living. We had been through a lot to deserve that title such as assassinations of JFK, RFK and MLK, civil rights, the “sixties,” Vietnam, Watergate, a recession, The situation seems to have escalated now that 9/11 has come and gone leaving the world in a new atmosphere of threat followed by a broadening economic recession with high unemployment, and wars in Iraq and Afganistan to name a few in a myriad of possibilities for stress.